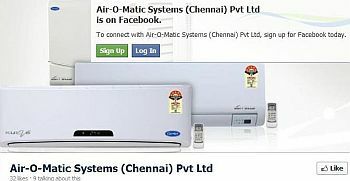 Air-O-Matic systems was formed in the year 1994, with an experience of more than 40 years of collective experience of the founders, all in air conditioning alone, having worked in multinationals as well as Indian companies covering all aspects of airconditioning. With the philosophy of "COMMITTED TO YOUR COMFORT", the team started building a solid foundation. Today the uniquness of the company is its second line of managemnt, ready to continue the journey smoothly into the future that looks very bright for the company as well as the entire industry. Decision making is delegated at all levels appropriately to ensure that the client does not feel any delay at any stage, for want of authorisation, which is very common in this line of business! Willis H Carrier invented modern airconditioing in the year 1902. After working in many leading technology companies in the US, he then formed Carrier engineering corporation in the year 1915. Today it forms a part of UTC group of companies, having its presence in almost all high tech manufacturing fields all over the world. Understanding the importance of Indian market Carrier is investing heavily in to manufacturing in INDIA, bringing in new technology as well as collaborations. Soon Carrier will have the biggest air conditioning manufacturing plant in India, compelling Indian manufacturers to take notice of this plant rather than China. The net result - Rewards for ALL Indian client - With international quality - At Indian prices! Promoted by qualified technocrat engineers, having spent more than 25 years individually in the air conditioning field. To us it does not matter, how big or small a client you are. You are our client and simply deserve the best of service and attention. We fully appreciate the need of quality after sales service, even if you buy the best of the AC unit! We have consciously built our team that fully understands & values these philosophies. Thus, out of 4 times for which BEST SERVICE AWARD was declared by Carrier Aircon Ltd, we have won it for 3 times.